In my part of the country, it’s still rather chilly. The spring fruits and vegetables are not in the grocery, except those brought from afar, and the farmers’ markets are not yet open. 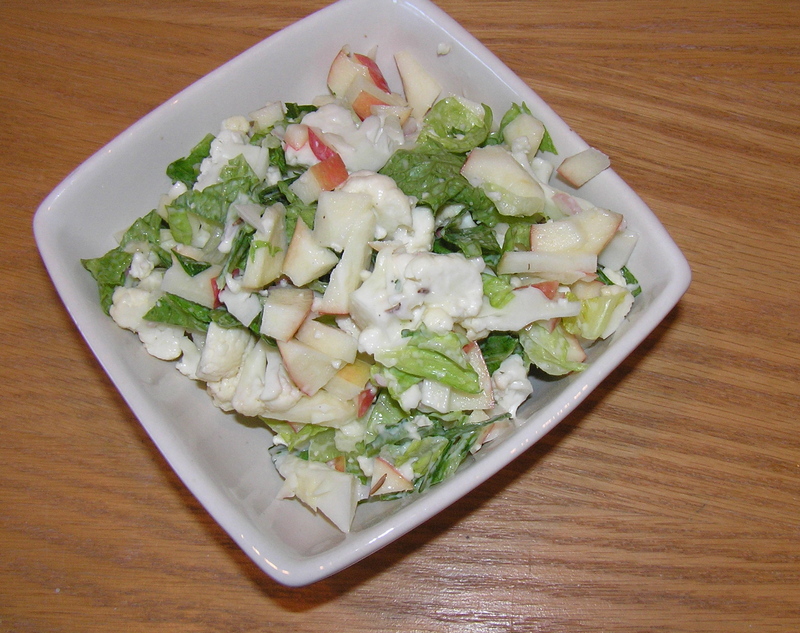 This salad takes advantage of late winter produce while creating a salad that is crisp and refreshing. It holds well in the refrigerator if you need to make it in advance. The original recipe came from Eating Well. The flavor combination of apples and cauliflower is a bit unexpected, but very good. Whisk mayonnaise, vinegar, shallot, caraway seeds (if using) and pepper in a large bowl until smooth. Add cauliflower, romaine and apple; toss to coat. Makes 6 servings at 2 grams of fat/serving. While reorganizing all the containers of frozen goodies in my freezer, I came across two boxes labeled “Mushroom Bisque.” I remember that as being one of my favorite soups, warm and comforting. It almost always makes me want to curl up for a nap. (Hmmm, maybe it’s the sherry in the soup.) So when I came in from some frigid outdoor chores, I microwaved a bowl, and immediately after eating curled up under the down comforter for a nap. That being said, it is also an elegant dish to serve for company. Then I remembered that I had photographed the soup, garnished with mushroom slices, when I first made it for a small dinner party – and before it became a delightful frozen leftover. I can’t remember where the original recipe for the soup came from. I know it was called “Mushroom-Cauliflower Soup”, which did not make it sound very appealing. This was one of the soups I made because of aging mushrooms and cauliflower that I needed to use. And was I ever surprised! Don’t let the old name put you off, though. You don’t even know the cauliflower is in there – it just tastes like a cream soup. Coarsely chop mushroom. Spray a large pan with cooking spray and melt butter over medium high heat. Add mushrooms and onion and stirring often until mushrooms begin to brown, 12-15 minutes. Add flour and mix well. Remove from heat and stir in beef (or mushroom) broth, sherry, and 1 cup of water. Add cauliflower. Return to high heat and bring to a boil. 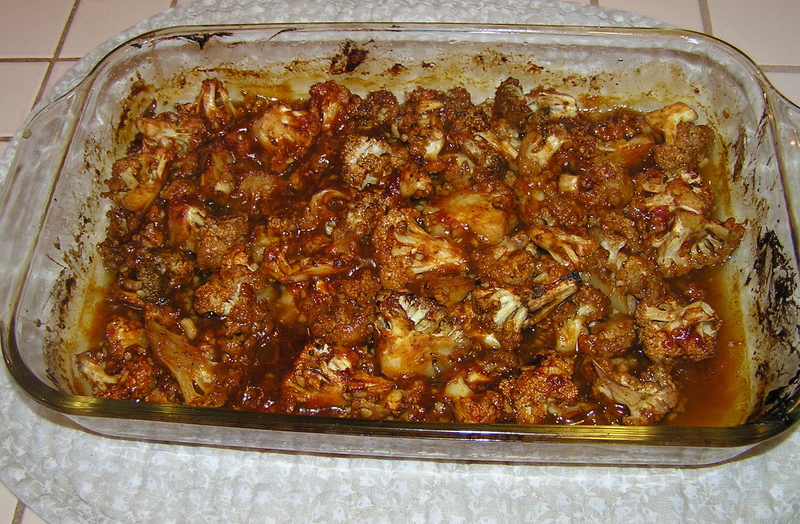 Reduce heat, cover and simmer until cauliflower is tender when pierced – about 5 minutes. Put 1/3 of the soup in a blender and puree, taking the center lid off and putting a kitchen towel over the hole to prevent splashing. Repeat until all the soup is pureed. Return to the pan and stir over medium heat until steaming. Makes 6 soul-warming servings at 2 grams of fat/serving. When I first saw this recipe in Cooking Light, I was a bit skeptical. Ketchup and cauliflower? I don’t know…and although it supposedly hails from China, it uses Garam Masala, a decidedly Indian spice. Still, there was something intriguing about it, and I had a cauliflower to use up in some interesting way. It turns out to be a really tasty, sweet and salty dish, and it’s easy to make. It could be part of a dinner with other curries, or a hearty side dish. Preheat oven to 425 F. Coat an 11 x 7 baking dish with cooking spray. Combine cauliflower, Garam Masala, and salt with 1 teaspoon of the canola oil in a large bowl and toss well. Bake at 425 for 20 minutes. Remove cauliflower mixture from the oven. Stir in ketchup mixture. Bake at 425 for an additional 20 minutes or until cauliflower is tender, stirring after 10 minutes. Makes 9 half cup servings at 1.5 grams of fat per serving (although I personally ate it in one cup servings. A note on Garam Masala: Garam Masala is a spice mixture used in many Indian dishes. Garam means hot and Masala means spice mixture, so the spices used are those that give some heat to the dish. I use a good commercial mix, such as Spice Islands, or one from an Asian market. In India, many households have their own family Garam Masala recipe, handed down through generations. You will find varied recipes for Garam Masala in Indian cookbooks and can try your hand at mixing your own family recipe, toasting the spices and grinding them in a spice grinder or mortar and pestle, but for most uses, I like the convenience of a prepared blend.